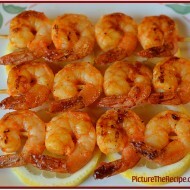 Spring is in the air and I’m ready for grilling season! To kick start the season, I have some delicious, and super easy to make- Cilantro Lime Chicken Skewers with Bell Peppers & Onions. A super quick 10 minutes to make this marinade and you'll have the the most flavorful, juicy chicken breast skewers with bell peppers and onions ready to grill, or pop in the oven for a weeknight meal. – Start by dicing the onion in big pieces (roughly 1 1/2 inches or so) and separate the layers. Discard the small pieces (or save them for another dish later). – Dice the bell peppers about the same size. I used one red and one green pepper, but feel free to use any color peppers you want. 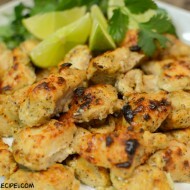 – Next, dice the chicken breast in roughly the same size cubes and add it to the same bowl. 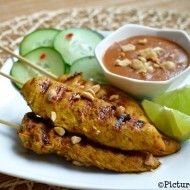 – For the marinade, tear off the ends of the cilantro stalks and roughly chop it and put it in the food processor bowl. – Roughly chop the green onions & garlic cloves and add them also. – Zest about have a lime for some freshness and add the juice of the whole lime to the processor bowl. 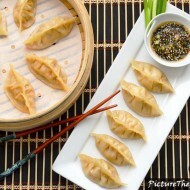 – Add the fish sauce, seasame & chili oil then pulse the processor until you get a chunky paste. – Pour the marinade over the chicken, onion & peppers. Mix everything well, so every piece is coated in the marinade. – Cover the bowl with cling film and set it in the fridge for a minimum of 30 minutes or for a couple hours. – Then skewer the peppers, chicken and onion anyway you like. I went with a pepper, chicken, onion, chicken, pepper, chicken, pepper, chicken and onion. So every skewer had four pieces of chicken. – You can grill the chicken skewers if you have a grill. In my case, I don’t have an indoor grill and didn’t feel like firing up the charcoal barbeque just for the skewers, so I gave the skewers some color on all sides, in a very hot cast iron pan and then popped them in a 400F oven for 15 minutes until the chicken was cooked through. I then gave the skewers a blast under the broiler for a couple more minutes to give it a grilled flavor. 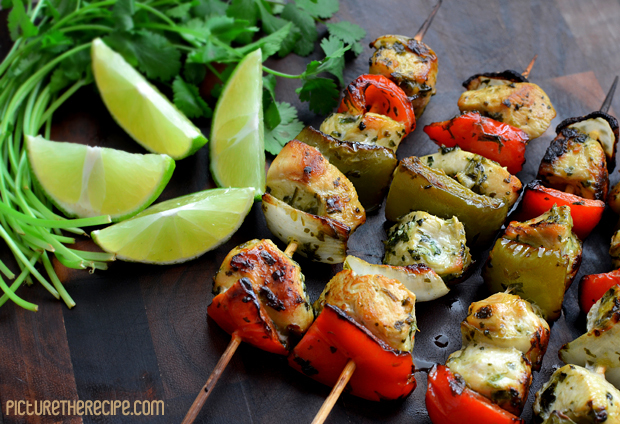 – Serve the chicken skewers with some fresh chopped cilantro and lime wedges.